This volume is a tribute by his peers, and by younger scholars of the next generation, to Harvey M. Friedman, perhaps the most profound foundationalist since Kurt G�del. 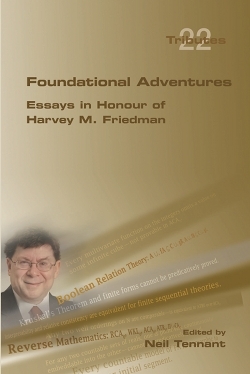 Friedman's researches, beginning precociously in his mid-teens, have fundamentally shaped our contemporary understanding of set theory, recursion theory, model theory, proof theory and metamathematics. His achievements in concept formation and theory formulation have also renewed the standard set by G�del and Alfred Tarski for the general intellectual interest and importance of technical work in foundations. Friedman pioneered the now well-established and flourishing field of Reverse Mathematics, whose aim is to calibrate the intrinsic logico-mathematical consistency-strength of all the important theorems of mathematics. He has relentlessly pursued the full extent of the incompleteness phenomena into which G�del provided the first revealing glimpse. The G�del-Friedman program, as it is now deservingly called, seeks to find simple, natural and elegant mathematical statements of a combinatorial nature, that can be proved to be independent of set theory even when extended by powerful large-cardinal existence axioms.